← The Kohl Centre at Virginia Tech: Beyond-the-Classroom Learning Opportunities in the Agricultural and Applied Economics Department. At long last, the “Federal Agriculture Reform and Risk Management Act of 2013” (FARRMA), soon to be referred to as the Agricultural Act of 2014, was passed in the House of Representatives by a vote of 251-166, with Republicans voting 162-63 in favor of the Act, and Democrats voting 89-103 against. The Senate will probably pass the measure in the first week of February, and President Obama will sign the bill into law soon thereafter. After more than 2-1/2 years of legislative gridlock, there will finally be a Farm Bill that provides for commodity and conservation support, food and nutrition assistance, and other rural and agricultural programs for the next five years. As estimated by the Congressional Budget Office, direct spending on FARRMA over the next ten fiscal years will be $956.4 billion, although the bill authorizes most program expenditures only over 2014-2018. 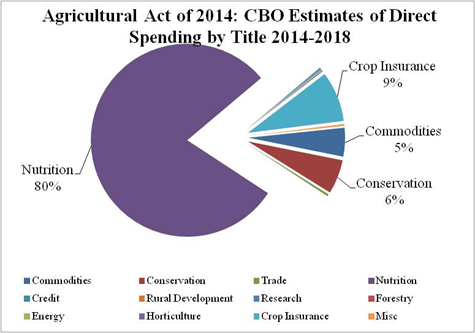 Spending for five years is estimated to total $488.6 billion, broken down by Farm Bill title (i.e. section) in Figure 1 below. Most of these expenditures (80%) are estimated to be in food and nutrition programs such as SNAP (Supplemental Nutrition Assistance Program), WIC (Women, Infants, and Children), and the School Lunch Program. Of the remainder, crop insurance is estimated at 9% of the total, conservation at 6%, and commodity support programs at 5% of the total. All other FARRMA programs sum to just 1% of total expenditures over 2014-2018. The following presents a brief summary of some major changes in Commodity Support, Crop Insurance, and Conservation in this Farm Bill. The effective price is the higher of either the midseason price (average of prices for the first 5 months of the marketing year) or the national average marketing assistance loan rate. That difference between reference price and effective price becomes the payment rate, which is multiplied times the payment yield (as determined under previous Farm Bills, but also can be updated once based on more recent yields for PLC) and payment acres (85% of historical base acres) to arrive at the PLC payment amount. The program is estimated to cost $5.1 billion over 2014-2018. County ARC payments are made if the actual crop revenue for a covered commodity is less than a county revenue loss trigger (86% of a benchmark county revenue). The actual county revenue is equal to the product of the county yield and the higher of either the midseason price or the national average loan rate. The benchmark county revenue is the product of the Olympic average county yield over the previous 5 years and the average national marketing year Olympic average price. The payment rate is the lesser of: 1) the difference between the county revenue loss trigger and the actual county revenue, or 2) 10 percent of the benchmark county revenue. The payment amount is then the payment rate times the payment acres (also based on historical base acres). Bottom line, ARC covers between 76-86% of county benchmark revenue for the crop. To the extent possible, irrigated and non-irrigated crops will receive a separate county revenue loss trigger and actual county revenue for the commodity. ARC is estimated to cost $$6.5 billion over 2014-2018. The Farm Bill also establishes a total spending cap on PLC and ARC spending of just under $17 billion over 2014-2020, and payments will be reduced if those limits are approached. There are many, many more details of these two programs that require more in-depth treatment. For example, one difficult issue involves program base acres, which remain the same as current base, but producers can reallocate the portion associated with planted (and covered) crops over the 2009-2012 crop years. In addition, PLC payment yields can be updated to 90% of the farm’s average yield per planted acre over 2008-2012. Both ARC and PLC are new and complicated programs, and more implementation details will be forthcoming. However, producers will need to quickly learn their alternatives and soon make a decision affecting government payments over 2014-2018. Cotton, alone among commodities supported in the Farm Bill, will receive partial Direct Payments in the 2014 and 2015 crop years. In 2014, the payment will be based on 60% of cotton base acres, and in 2015, the payment will decrease to 36.5% of cotton base acres. Cotton producers are eligible for the marketing loan program as well as the Stacked Income Protection (STAX) revenue insurance beginning in 2015. The traditional nonrecourse marketing loan programs were retained from the 2008 Farm Bill. Marketing loan rates were unchanged, except for cotton, which can vary between $0.48 and $0.52 per pound. The Dairy Product Support program, the Milk Income Loss Coverage (MILC) program, the Dairy Export Incentive program and the Federal Milk Marketing Order Review Commission are repealed, with a new Dairy Production Margin Protection program (DPMP) taking their place. Producers participating in DPMP select a margin coverage (based on the difference between milk price and feed cost) of between $4-$8 per hundredweight. The lowest margin is available without a premium cost, with the opportunity to purchase higher margin insurance at specified premium prices. If the margin falls below $4/cwt for a two consecutive months, then the basic margin protection applies to 80% of the farm’s production history. Disincentives are built into the program for increased milk production, but no supply management is included for dairy. The crop insurance programs under the purview of the Risk Management Agency/USDA receive substantially increased funding, reflecting the new emphasis provided to safety net protection rather than direct price or income support. Crop insurance program expenditures are expected to increase by $1.8 billion over 2014-2018. The Supplemental Coverage Option (SCO) is intended to be a “shallow loss” insurance program, covering small losses that are less than the deductible on other purchased revenue insurance. Revenue losses are triggered if county revenue shortfalls exceed 14 percent of normal levels defined by the Federal Crop Insurance Corporation. Crops that are enrolled under ARC or STAX are ineligible for SCO. Expenditures on crop insurance are expected to rise from $6.4 billion in 2014 to $9.1 billion in 2018, reflecting the increased emphasis on insurance safety net programs in the new Farm Bill. The Farm Bill consolidates 23 conservation programs into 13 programs, as a rule by folding smaller into broader programs. However, conservation program funding was not reduced as severely as some environmental organizations feared. Decreased funding for major conservation programs is, on average, offset by increases in others. Over 2014-2018, all conservation programs are reduced by a total of only $0.2 billion. The Conservation Reserve Program (CRP) is retained, but its acreage limit is gradually reduced to 25 million acres. EQIP funding is maintained at the current level, but must also support the Wildlife Habitat Incentives Program (WHIP), which has been rolled into EQIP. The Conservation Stewardship Program is maintained, but suffers $512 million in cuts and is limited to 9 million acres enrolled per year. All agricultural easement programs are re-packaged into the Agriculture Conservation Easement Program (ACEP), which acquires most of the funding increases provided by FARMMA. The Chesapeake Bay watershed program (within the Conservation title) is repealed, as are other regionally defined programs such as the Great Lakes Basin program. One of the many issues of contention in the Farm Bill debate was conservation compliance as applied to crop insurance program participation. With the demise of direct payments, producers would have no longer been required to comply with conservation provisions on Highly Erodible land and other environmentally sensitive sites. In a change from the 2008 Farm Bill, the new Farm Bill requires such conservation compliance for purchasers of crop insurance.